Mt. Crested Butte four bedroom vacation home with mountain views. 3,500 Square Ft. Villa Within Walking Distance to the Slopes! The name says it all — Grand Villa! Everything about this home is on a grand scale: the views, the location, the size, the amenities. Located right across from the ski resort, this 3,500 sq. 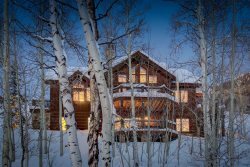 ft. luxury home is sure to be the perfect base camp for all of your family's adventures in Crested Butte. With 4 bedrooms, all with en-suite baths, and another full bath in the media room, and half bath in the living area, your group will no longer have to wait for the hair dryer in the mornings! Grand Villa is furnished with only the best, and your group will be wrapped in style and comfort after a great day exploring paradise. When you arrive, pull into the oversized 1 car garage and immediately get a sense of how everything in this home is on a grand scale. The mud room/laundry has plenty of space for everyone’s boots and shoes, regardless of the activity. Step out of the mud room into the large entry hall and walk over to the media room with comfy couches, full bath, and wet bar. It's a great place to watch the big game or let the kids have their own space. One of the couches can also be used as a queen sleeper sofa. One level up is the main living area of the home and the master bedroom. The high ceilings and the open concept means your group can relax in grand style and everybody is close to the action. The well-appointed kitchen has granite counter tops and stainless appliances, and will please even the most discerning chef. Curl up around the gas fireplace or relax outside on the large deck with outdoor dining set; all while taking in breathtaking views of the ski resort and Mt. Crested Butte! If you get the urge to hike or ski, the mountain is just a 5 minute walk out the front door. There is also a powder bath off the living room on this level. Step into the master suite and RELAX! The floor to ceiling windows take in the spectacular views from the king bed. There's a great chaise lounge to read a good book, as well as TV and wet bar for a late night snack from the fridge. (Maybe you didn't want anyone else having the leftover pizza?!) The master bath is luxurious with a shower, soaking tub, and dual vanities. The third level of the home finds 3 more luxurious bedrooms each with en-suite bath. There is a junior master suite with king bed, and the junior master bath has a soaking tub, dual vanities, and shower. Across the hall is a queen bedroom with vaulted ceilings and spectacular views looking out at Mt. Crested Butte. Also on this level is a large bedroom with double bed and twin trundle bed if needed, colorful artwork, and en-suite bath. Incredible views, sumptuous furnishings, great location, and space for the whole family! What are you waiting for? Grand Villa is ready to welcome your family to Crested Butte! Give us a call today to book your memories. The property enhanced our experience and exceeded our expectations! Every member was helpful and accommodating. Place was nice, well appointed, we liked it overall. This was a beautiful property with very nice amenities and an amazing view! We would certainly stay there again!